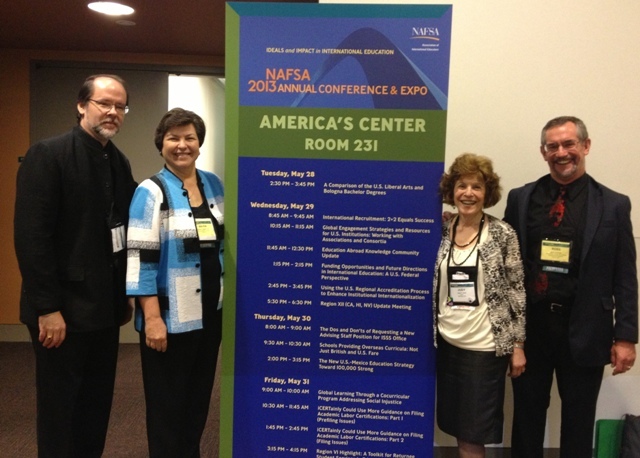 I greatly appreciated the opportunity to meet with many colleagues at the NAFSA: Association of International Educators annual conference in St. Louis. I was gratified by the high level of interest in Vietnam and the number of new schools that wish to recruit and engage in other activities here. On a personal note, I was also happy to make my escape from St. Louis after a final night of tornado warnings, high winds, rain and power outages. For those of you who attended, or who were interested but unable to attend, the NAFSA session, International Student Recruitment: 2+2 Equals Success, about the advantages and benefits of two- and four-year institutions engaging in joint recruiting and marketing activities, at which I presented, along with Judy Irwin (Connect Globally/American International Recruitment Council), Ross Jennings (Green River Community College) and Maria Hesse (Arizona State University), you can download the PPT presentation from the session blog. I have since heard from a number of colleagues who are starting to recruit jointly. The majority of those attending the session had more than 10 years of experience in the field of international education. 21% of those attending the session live or work outside of the United States. The overall satisfaction score was 81%, which is above the overall average for all sessions.